During a routine valve assessment procedure, it was noted that the gearbox mounting bolts were unusually short with only a few threads mating the two components together. Typically mounting bolts connect the gearbox to the valve housing and when operated, stop the gearbox rotating (shear stress) on the valve housing thus transfer the torque to opening or closing the gate. The spindle is held within its longitudinal axis via a thrust ring located within the valve body itself which allows the gate to either rise or fall on the spindle threads dependent on the direction of operation. In this type of valve the thrust ring is held within the gearbox and as such the forces from within the pipe are being transferred through the spindle acting in the direction of the gearbox. This action introduces tensional stresses along with the shear stresses already discussed by basic valve operations. Any failure would allow the gate to be forced up into the valve body with possibly catastrophic consequences. 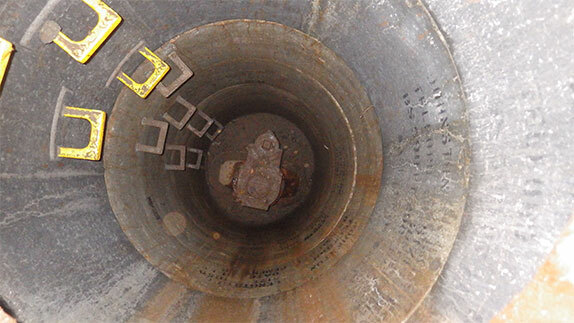 It is very important to identify this type of valve within a network and ensure an approved procedure is in place for their assessment, along with a methodology for repair which includes full control of the asset.